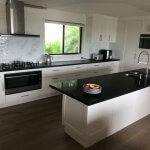 Professional couple Ian and Frances chose the team from All About Kitchens Qld located at 177 Brisbane Road Mooloolaba to custom design, Project Manage, locally manufacture and install a fabulous new Hampton Style Kitchen to their home at Noosa Heads. The cabinetry comprised of Satin Painted Two Pac square faced doors and panels with kickboards to match, beautiful Caesarstone Benchtops and Tile Splashback to the kitchen with Blum hardware throughout. This beautiful home was totally transformed by our professional team of tradespeople. 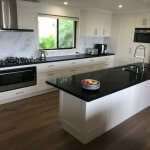 If you are looking to install a new kitchen or other cabinetry then you need to speak to the professional fully qualified team at All About Kitchens Qld for your free in house measure and quote. 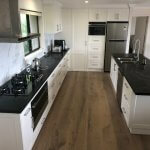 All of our workmanship is provided by qualified QBCC fully licenced local trades people with full manufacturing here on the Sunshine Coast from our factory located at Kunda Park. We have our own team of Builders, Plumbers, Electricians and more for your home renovation….. All of our kitchens and cabinetry come with QBCC Warranty Insurance. Buy Local, employ local and support your local region, the Sunshine Coast. We invite you to our showroom to view our quality cabinetry on display at All About Kitchens Qld 177 Brisbane Road Mooloolaba Ph: 5444 3317. You too could have a beautiful kitchen and cabinetry like this in your home.